Cut snowman shapes out of felt. Decorate each snowman with a felt top hat. Punch a hole on each side of the snowman. Cut two circles out of paper. Bend one in half and glue one side to the second circle. Cut and glue a paper ornament topper to the top of the circle. Glue a piece of string to the back of the topper. Pull the string tightly and glue to the back of the card. Paint clothespins and an embroidery hoop. Glue clothespins onto the hoop. Cut two felt leaves and glue near the top of the hoop. Glue small felt circles and buttons to the leaves. Thread a string through the top of the hoop. Cut a dove shape out of felt. Glue a teardrop wing to each side. Decorate with feathers. Add a black-marker dot eye to dove. Pierce the beak of the bird with a scissor tip and slide a one-inch piece of white floral wire through the slit to make an olive branch. Attach two felt leaves to each end of the wire. Glue dove to the wreath. Trace a cookie cutter on a piece of felt and colored paper. Cut out shapes and glue together. Punch a hole at the top center of the tag. Add a string to attach to a gift. It’s not officially winter until you make a paper snowflake. Learn the folding tricks online at snowflakes.barkleyus.com (we challenge you not to spend at least 15 minutes with this tool). Once you’ve got a bunch, string them up to hang on the tree, the mantel or over a doorway. Have a toddler? Let him “decorate” the paper with crayons, markers or stamps before you make the cuts. Set up a hot-chocolate stand. On a mild afternoon when families will likely be outside, offer cups of hot cocoa, along with candy canes for stirring. Donate the proceeds to a charity of your child’s choosing. 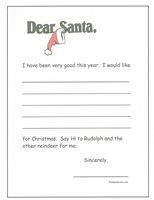 Free printable Santa letters are the easy way to find out a child’s Christmas wishes. In the average daycare setting, the children are so excited about the upcoming holiday … they talk about it for weeks. 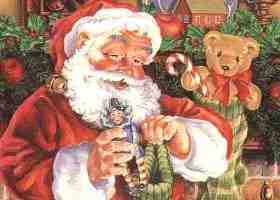 They love everything about the holiday, but what intrigues them most is the idea of Santa Claus. They love hoping and wishing that Santa will bring them that one special item they want more than anything else. And what is the best way to let Santa know a child’s wishes? Writing him a letter of course! So … print off several copies of the letter and let the children get busy. Typically the children will be very excited about writing the letter. It’s also interesting for the provider who will get to hear an assortment of wishes, some that are surprising. I was once told by a child that what he wanted more than anything was for it to snow on Christmas morning. He had moved to Minnesota from California a few months prior, and although he had the opportunity to see and play in the snow… he believed that Christmas morning snow was magical. He believed that if you made a wish while the snow was falling, your wish would absolutely come true! Simply click on the letter to go to the PDF file for immediate printing. There are several ways this free printable Santa letter can be used. Older children can, of course, simply be given a pencil to fill in their wishes. Younger children can dictate what should be written on the letter. OR… children can be given crayons to draw small pictures of what they are hoping for. OR… save all the flyers and catalogs that arrive in the mail at this time of year. Let the children cut out pictures of what they would like to see Santa bring them, and paste the pictures to the letter. Wait … there’s more fun. Place all of the letters in a large manila envelope and address the envelope to Santa Claus at the North Pole. Let the children see you doing this and assure them you will take the envelope to the post office personally. (The fact that you won’t is our little secret … wink, wink). Then … get some holiday themed printer paper and write letters to the children FROM Santa Claus. Make sure each child’s letter is written specifically to them, making each child’s letter unique. Don’t promise anything specific in the letter in reference to gifts, … simply elude to the fact that Santa knows the child has been good and will be stopping by on Christmas Eve. Print a copy of each letter on the themed paper, place in an envelope, and address a separate envelope for each child. Make sure the return address is, of course, Santa Claus at the North Pole. I used simple address labels I printed out on the computer, but added a couple of Christmas stickers to the outside of each envelope to make it more festive. **Make sure each letter has the correct postage. Then … place all the labeled (and stamped) envelopes in a large manila envelope. Letters must be received in Anchorage by December 15th. The kids will then receive “letters from Santa” with an “official” North Pole postmark. If you think that kids are excited enough about Christmas … wait until you see their reaction to personal letters from the North Pole!